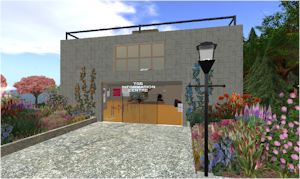 TSB Information Centre—A two-story building houses posters and video showcasing TSB’s missions and goals. Project Centre—This area showcases a virtual straw-bale home and virtual replicas of the Aquamarine Power Oyster, a technology designed to capture energy contained in waves close to the shore. Drayson House - Private—a small home sits on a rise located in the southeastern portion of the sim. This area is restricted to visitors.